1) Having an awareness of culture and power dynamics is essential to creating a healthy, safe environment where students can learn and thrive. Students come to every classroom from a variety of backgrounds. Some of them may walk in the door with the feeling that they can’t learn or having already made a choice to “not-learn” (to use Kohl’s terminology). It in an instructor’s responsibility, to the best of his or her ability, to try to recognize the character of each student and have an awareness of the cultural circumstances from which the student comes. Using this knowledge, the teacher can then attempt to meet the student “in the middle” and sway them to understand that they can learn and that (hopefully) they should desire to. Often, students will come from backgrounds which cause them to distrust their teacher. For instance, an African-American student may have an ingrained distrust of “white” teachers. Or in another example, a Muslim student may have made the decision not to learn from non-Muslim instructors. It is important to recognize that both of these communities in the US have been the targets of large scale (and often systemic) hatred and discrimination, and so the student’s feelings of mistrust very well may come from a very understandable and reasonable place. The important thing for the teacher is that he or she work to create a feeling of a safe space, a feeling like the student can really trust him/her and really be actually heard and listened to. The student needs to know that his or her viewpoint matters and is important to the teacher, regardless of what that viewpoint is. Friendships absolutely can be formed across racial, socioeconomic, religious, etc. lines, and positive, uplifting teacher-student relationships can too. However, the onus is on the teacher, as the adult and the trained professional, to pro-actively seek the student’s success. A second phrase I would choose from the word-wall is “internalized aggression.” Internalized aggression is when a person takes things said about them by others (or about people of their culture, race, religion, etc) and internalizes them. A really good example of this can be found with Alaska Natives who refer to themselves as “dumb Indians.” Clearly, this was something that other people said to them (or their parents, etc) at some point in the past and it kind of stuck. Many were told that because they struggled to learn English in the boarding schools, they were stupid or incapable of learning. For some in Native culture, this has become truly internalized into a form of what might be called self-hatred. It also acts as an excuse for failure or for failure to even try. I chose this term because I am quite sure that I will encounter the phrase “I’m just a dumb Indian” at some point or other in my teaching career, and I emphatically reject it. I know my fiancee has encountered it in her teaching career. A third phrase that I would choose is “critical thinking.” Critical thinking is a higher order cognitive skill that involves seeing and being able to express the connections between things. It is much more advanced that the mere memorization of facts. I chose this phrase because I see it as the goal of education. It must be carefully cultivated, but it is the goal. It is much harder for a teacher to bring about than the mere repetition of facts and data, but it is so much more valuable to the students as individuals and to society, as well. 3) I cannot really fully answer the part of this question that is about content and units. I am not even sure what subjects I will be student teaching in. My fiancee is the social studies teacher at my placement, so I won’t be student teaching under her. But village schools demand a lot from teachers (e.g. my fiancee also teaches math, computer programming, and music), so I expect I will probably be teaching in more than one content area. My best guess is that they’ll use me primarily in English, but in a very real way, I won’t know what they want me to do until I get there. As for methods or strategies I intend to use, my first strategy is that I intend to learn as much about Yup’ik culture as I can, especially the culture of the village. I also hope to begin to study and work in the Yup’ik language, so that I can address issues and questions with words that might make more sense to students. Also, as I learn some of the different word associations that happen in Yup’ik (vs. American English), I expect that my teaching might become more sensitive and appropriate. Beyond this, I plan on attempting to build lessons based on observations of life or on elements of Yup’ik history and culture. Asking students questions at the beginning of lessons is a good idea, since it will help me try to figure out where they are coming from and also to tailor my lesson to the knowledge base they are bringing to class with them. Honestly, the teacher in me learned quite a bit from the PBL exercise we did for ALST 600. 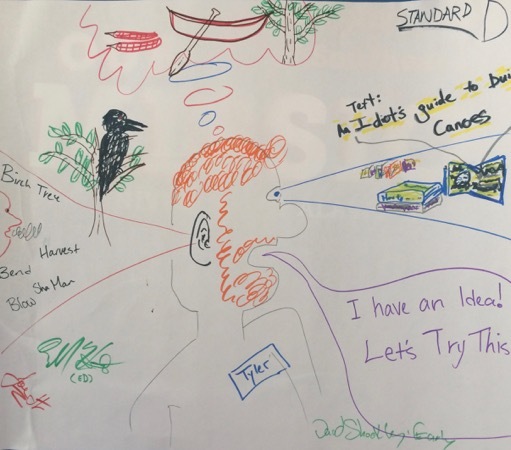 The first thing I think I would say is I learned is that if you’re going to do a large PBL exercise like we did, you need to be fairly specific about what sort of content goes into it. This is especially the case if the project is supposed to be on something like parallel introductions to regions, etc. I feel like there should have been a set of topical guidances which would have ensured that each region had elements of things like the effects of ANCSA or the establishment of the modern transportation structure on the region. I know that we were supposed to focus around six broad questions, but I think it would have been better if this had been a larger, but more specific, list, especially a list drawn from the instructor’s prior knowledge of multiple textbooks/history books. As it was, I feel like the introductions may have missed elements critical to understanding each region. Another thing I realized is that we really needed to have some sort of summative activity. Now, I’m not blaming anyone for how the end of the class happened; this was an experiment. But what I’m trying to say is that I feel like I learned the most only about my region. But in order to accomplish the objectives of the class more thoroughly, we really needed some kind of individual or group presentations at the end of class, so that we could all be exposed to the content from every region. Last year I participated in a student-led class which was about 2/3 student presentations and 1/3 lectures by the professor. It was a lot of fun. If there had been student research leading to group presentations in class, I think it would have been more effective. Additionally, I think that if I want to use PBL type assignments in class, I need to put them in a carefully scaffolded context. I think doing something like what we did after a series of lectures giving general background could have been very helpful. I’m absolutely sure I’ll use PBL in my future work. I think, for me, a major takeaway is that it needs to be tweaked and set up a little differently. Honestly, the way it happened generated a lot of anxiety for a lot of the students in the class. Instructions and expectations needed to be clearer. I would not want to do that to my high school students, and I believe that with good scaffolding, clear expectations, and a presentational conclusion, this method can be very beneficial to students on their journey of discovery. Cultural Standard D is among my favorite of the cultural standards. Basically, it encourages teachers to try to synthesize knowledge that is being passed down orally in a culture with book knowledge that comes from “experts” of one sort or another. To apply this standard to my own home region and the discipline of Social Studies, I might begin a lesson on the Pennsylvania Lumber Boom and the lumber barons by asking kids how old the trees in our region are. Maybe they know that, maybe they don’t. But then I could proceed to ask them, “were most of the trees around here standing in 1776?” Well, maybe they don’t know that. So I might ask them, “is our forest here considered old growth or new growth?” By this point, I am quite sure I’d be jogging some memories and answers like “new growth” would be coming out. From there, I would ask, “why is it called ‘new growth? '” And I am quite sure that some of the students would know that it is because it was all cut down at some point. I would then shift gears and ask the students, “why are the city’s high school sports teams called ‘the Millionaires? '” I think some would be able to connect this to the lumber barons, because having their team called the Millionaires keeps that particular element of local history somewhat alive. Having gone this route and (I believe) piqued their interest, I would bring out an article on the lumber boom and its effects. Beginning from what they already know could make the lesson actually relevant to the students, and could attach the book knowledge to mental pegs that already exist in their heads. We really have had a lot of good presenters in this class. Scott had a great deal of insight, and I was quite taken by his introductory exercise and its questions for each person to discuss in a group. It was so basic and elegant. It helped us to know ourselves a little better and know one another. I wonder what other settings (even beyond the classroom) such an exercise could be used in? In any event, Ernestine’s story was very inspiring, in part because she is living something that I wish one of my best friends had lived. Hearing her reading, I think he would have appreciated it very much. He liked things that were gritty, because (I think) he had the mentality that it was only in hearing the gritty side of things that one can arrive at the whole truth. He certainly would not have been one to look at things only from the perspective of the white kids with their red-lipped mothers and well kept yards. But on the other hand, I don’t think he’d have been willing to stop with Ernestine’s take either. It just wasn’t how he was. He would want to go and find out how the white kids were perceiving things. Why did they run away from her drunken grandfather and his fish? Why did they make rude comments to her? What were their real underlying motives and assumptions? I doubt he’d have been sympathetic to them, in the end, but he would definitely have been driven to know more. 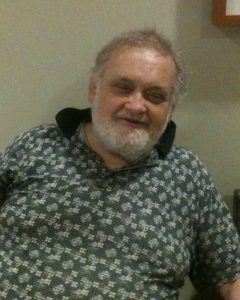 My friend Walter died last year. I gave a homily at his funeral. He was one of the best men I’ve ever known. And he’s not the only brilliant person I’ve known on the margins of society. But that’s a story for another time. Rest in Peace and Memory Eternal, old friend. When Orthodox people come in from outside, as I did in January when I visited, they very often are coached in how to adapt themselves to the rules of the local religious culture, and so I suspect differences that would otherwise become obvious are muted. There are exceptions to this, like, for instance, a few years ago when Fr. John Erickson, the respected former dean of St. Vladimir’s Seminary in New York, came to give some lectures. When he saw certain women standing outside the sanctuary where he was about to give his talk, he asked them to come in. When they refused and continued to try to listen from the doorway, he was told that this was due to the fact that they were menstruating. Understanding this, Fr. Erickson began to try to theologically convince them that it was okay for them to enter the sanctuary for the lesson. They laughed at him, thinking his request absurd to the point of being comical. Needless to say, he lost the argument. It is my hope, through the cultural component of my lesson, to begin to help address the very basic issue of “not all Orthodox people do it the same way,” and that a lot of this can be understood in terms of culture. But I’m not completely convinced my strategy is a winning one. I remember my fiancee telling me about arguing with some of her high school students about the existence of abortion. No, I didn’t type that wrong; I’m not talking about the ethics of abortion, I’m talking about the existence of abortion. When my fiancee asked one of her classes to compare general Republican and Democrat positions on a number of issues, including abortion, there were several who were unaware that it even existed. One boy, one of the better students at the high school, challenged her directly, assuming that she was simply making up the worst possible thing she could think of and trying to tease the class with it. He simply could not wrap his mind around it. It made no sense. It was completely beyond his cultural frame of reference. “Babies are good. Everyone wants babies.” What happens when you have a baby you feel like you don’t want or can’t take care of? “Well, you find someone else who wants one and give it to them.” And that is simply how it is done in the village. Later on that vacation, the students went into deep culture shock over things like restaurant menus (they had never eaten in restaurants before) and elevator buttons (they had never seen such things). Therefore, I am a little concerned that my lesson may be over-ambitious, at least in terms of the embedded videos that I was thinking about using. The Greek Orthodox parish video from New Jersey concerns me the most, actually. As I think about it, I’m beginning to have doubts that the students would even be willing to recognize these church people as actually being Orthodox. 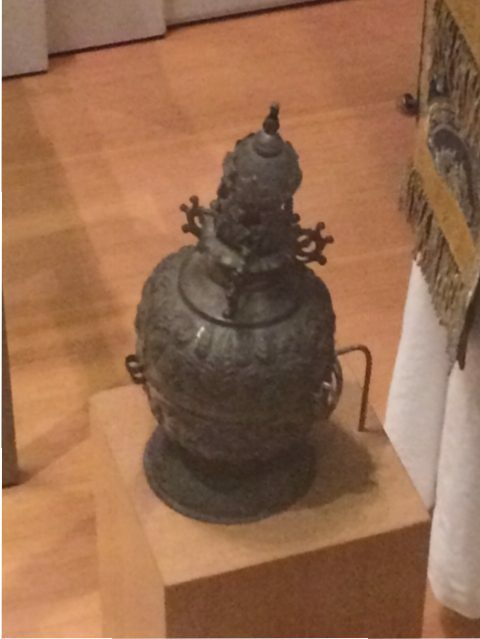 If students at the high school fought with my fiancee over a Roman collar, will they fight with me over all of the manifold, manifold Americanisms in the religious culture of this community that “prove” that clearly they are not Orthodox? In the time allotted for the picture book section in class, I read through 3 of them and looked at and quickly dismissed 2 more. Honestly, I found two of the three I read to be rather boring, moralistic, pedantic, and badly written. 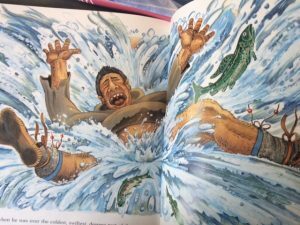 I think that, in general, one really needs to have a good, well-written story to catch students’ attentions if one is to use picture books at the secondary level. 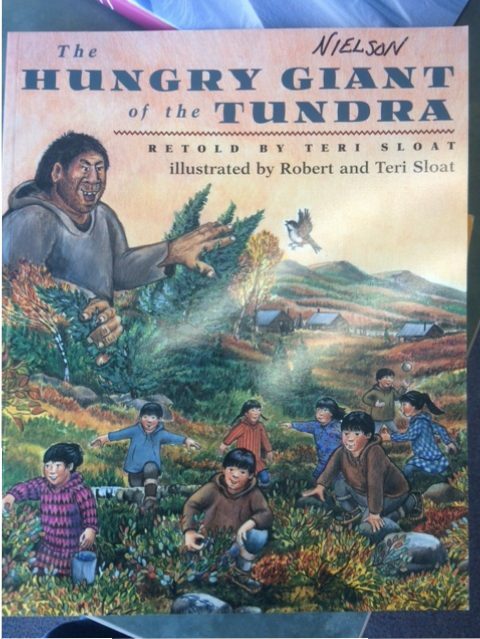 The major exception among the books I read was a book entitled “the Hungry Giant of the Tundra.” It was engaging from front to back. The illustrations were crisp and colorful and beautiful, and the faces very much had the look of the Yup’ik people, whose story the author claimed to be retelling. 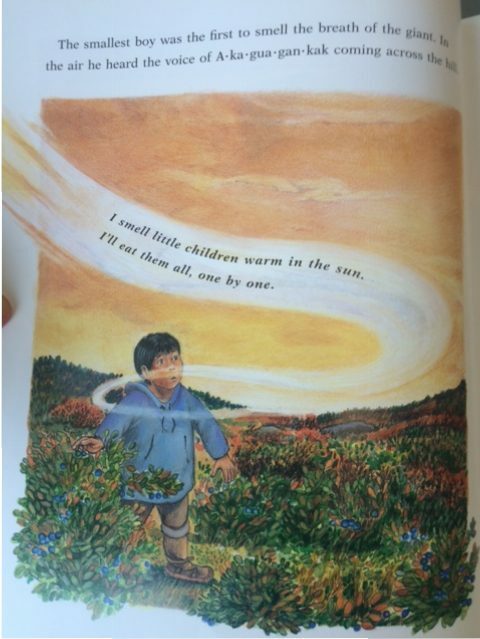 The basic plot of the story was that there were these kids playing out on the tundra and they were supposed to come back in at a certain time. 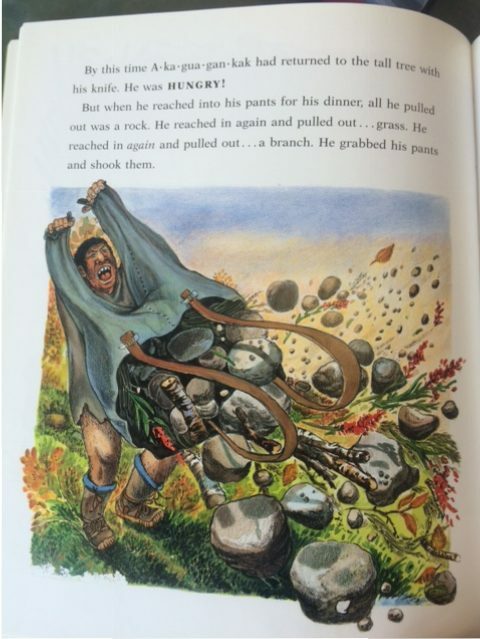 But they were enjoying themselves, so they stayed out and got captured by this ugly child-eating tundra giant. With the help of some animal friends, they elude the giant, and one of the animals even kills him. The moral of the story of course is that kids should obey their parents. As it is told, the story reminds me greatly of the traditional European fairy tale “Jack and the Beanstalk.” I am wondering, since we are informed that the story is “retold” by the book’s author, whether or not there is any European cross-pollination in the plotline. A way I could see using it in the classroom (especially in a Lit class) would be to find a more traditional telling of the story in Yup’ik terms and then place it next to Jack and the Beanstalk and ask the kids to compare and contrast the three, trying to answer the question of how, if at all, Jack and the Beanstalk may have influenced the retelling of this Yup’ik tale. I think it would be an enjoyable question to answer, and could get kids thinking about the way stories can be retold in later settings and by later people. I might even ask them to prepare a retelling of another story for me, or perhaps a retelling intentionally peppered with elements of another tale. It could really be a lot of fun. 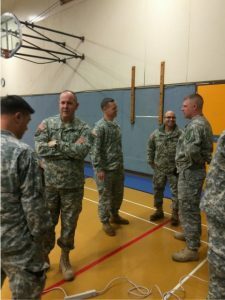 In January of this year, a large group of Army National Guard officers of high rank, including the overall commander of the Army National Guard (based in Washington, D. C.) visited the small village of Napaskiak, AK, near Bethel. Their ostensible mission was to deliver various awards, recognitions, and commendations to local veterans, but it was widely whispered in the area around Napaskiak that their true mission was to observe the customs surrounding Slaaviq, the Yup’ik Orthodox celebration of Christmas. Whatever their real intent, they made known that they would be arriving on a certain day in Blackhawk helicopters. They came, did their awards presentation, went to a house for the meal portion of Slaaviq, and then decided to leave. Well, by the time they were ready to leave, the winds had calmed down, and the Blackhawks had come. At this point, the commanding general and the delegation from the East Coast decided they wanted to go back down the frozen river in the heavy transport machines, rather than fly. 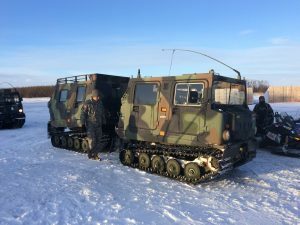 The local Alaskan guardsmen all got into the Blackhawks, knowing that the river had been deemed unsafe multiple times in the previous week. Those from the East Coast were incautious and oblivious to the potential danger. They did not understand the terrain. They put their lives in danger needlessly, and all the Alaskan guardsmen knew it. I think this is actually a good illustration of what a teacher who doesn’t practice Culturally Responsive Teaching (CRT) is like. Being insensitive to the local student population, just like the East Coast generals were insensitive to the conditions of their environment and the advice of the local servicemen, a teacher who does not practice Culturally Responsive Teaching flirts with disaster. Not understanding his own biases or the worldviews of his students, he may offend or wound them through racially or culturally insensitive language and actions. He might unintentionally reinforce racist or sexist stereotypes unconsciously, injure the self-worth of his students, and close down future potential learning opportunities for his students, as they adopt the view that their teacher doesn’t understand them and doesn’t have anything relevant to say. Even worse, they might adopt the view that members of their teacher’s race can’t speak to them. Obviously, on an individual basis, such outcomes are fairly unlikely. The effect of eschewing cultural relevance is most likely a simple, ineffective lesson, which, in isolation, is not the end of the world. But if the teacher goes down the ice road of cultural insensitivity often enough, at some point, he’s sure to go through the ice and create real problems for himself, his students, and his students’ future teachers.